I think it is pretty well established that I love Thomas Jefferson. I have written plenty of posts on his architecture (if you want a recap you can find them here, here and here ), so imagine my surprise when I found out that Thomas Jefferson is alive and well in Chicago, along with some of his founding father friends. For those of you who might not know what I’m talking about, let me introduce you to my new favorite thing (I have a lot of favorite things. It’s something I have in common with Oprah… well, that and we have the same birthday). That thing is the website I Made America. “I Made America” is a website dedicated to the modern-day exploits of George Washington, John Adams, Ben Franklin, Alexander Hamilton,Thomas Jefferson and James Madison (who isn’t well after his trip to the here and now) and how these paragons of America are dealing with life in 2012 after being transported forward in time. Who could ever have imagined that paying an electric bill would be a task beyond the grasp of the Father of modern banking, or that Pop Tarts would hold such allure to a former French ambassador? Here is a taste by way of the first episode. Though it’s more comedy than history, I hope you enjoy this as much as I do! Good day readers and sorry for the long absence. Are any of you as obsessed with Downton Abbey as I am? I started watching it from the very beginning, after years of being a quiet Masterpiece Theater fan, but then it just exploded this season! People are having Downton parties, dressing in 1910s fashion to hold discussion groups and mention of it has been on everyone’s lips wherever you go, so I thought that I would hop on the Downton train and give you guys the scoop on the Estate that we all know and love (though, if you haven’t watched the show yet, I forgive you). 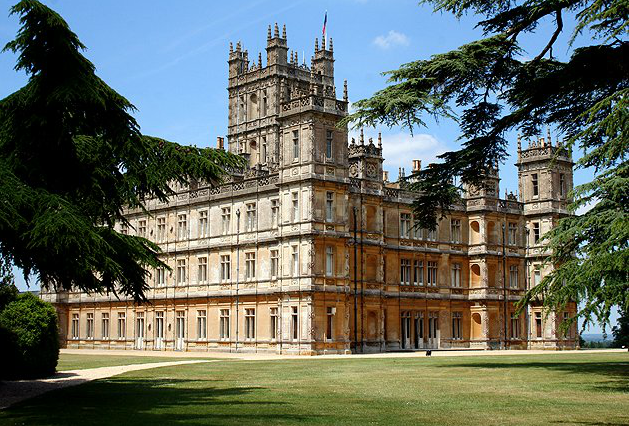 I now present to you the real-life Downtown: Highclere Castle. 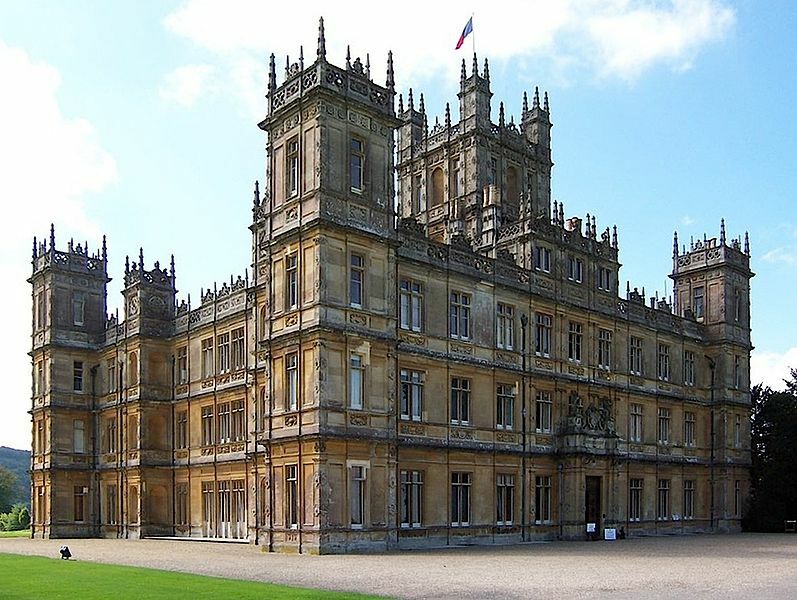 Highclere Castle, like many homes belonging to English Gentry, sits on the site of a medieval palace (funny how that often seems to happen). The earlier edifice was the residence of the Bishops of Winchester, later passing to the Carnarvon family in 1679, who have owned it since (and if you know anything about Egyptology, yes THAT Carnarvon). The house as we see it today, if one can really call it a house, was created in the 1840s. It was designed by Sir Charles Barry, the architect for the English House of Parliament. He called the house “Anglo-Italian” because he felt that it represented a melding of English and Renaissance architecture, but today we just call it Jacobethan, and it represents a style that represents a hybrid of Elizabethan and Jacobean architecture, incorporating both Renaissance Revival and 16th century English elements. The grounds and gardens actually predate this current iteration of the house. They were designed by one of my all-time favorite landscape architects, Capability Brown (no offense, Fredrick Law Olmsted, you’re still my favorite American landscape architect). Though his name wasn’t really Capability. His given name was actually Lancelot and he was just known as Capability… but still, either one is pretty awesome, you must agree! Capability Brown was the landscape architect to have if you were in the market to build an estate. He actually relocated the village to design the grounds of Highclere, you can still see the remains of the 1689 church at the Southwest corner of the manor. Now on to the photos, which are from Wikipedia and a blog called Friday flowers. Well I hope you enjoyed your tour of the real Downton Abbey. 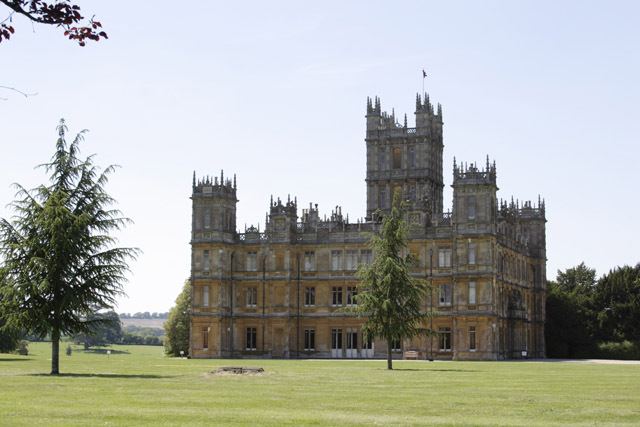 A fun bit of trivia for any British TV fans out there, Highclere also served as “Totleigh Towers” the home of the Bassetts in Jeeves and Wooster, starring Hugh Laurie and Stephen Fry. Have a great weekend and enjoy Downton on PBS on Sunday. Sorry for the long absence readers. I had a family emergency and then Ash and I went away for my birthday this past weekend. This really quick post is just to share a picture with you. 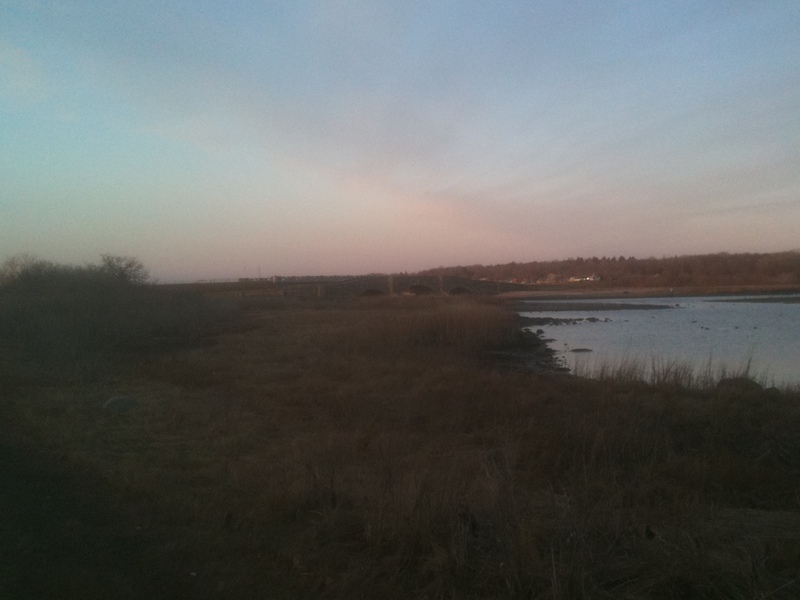 The pedestrian bridge below is located in Colt State park in Bristol Rhode Island and Ash snapped this pic on his iPhone and I thought it was so picturesque I just had to share. A new Friday Fantasy coming in a couple days!